The Broadway show “Hamilton” tackles debt in a rap battle in which Hamilton and Jefferson skewer one another in rhyme. It’s a passionate exchange on a topic that would otherwise put us to sleep. But, as Hamilton points out, debt is how government borrows money to get things done. And that’s what makes the subject of Proposition 53, an otherwise snoozy topic, contentious, with everyone from firefighters to cities to water districts lined up in opposition. Right now, the state has to seek voter approval to sell general obligation bonds for projects like buildings and highways because those bonds are repaid with taxpayer money from the state’s general fund. But revenue bonds, for the most part, don’t get repaid with general fund dollars. They’re called revenue bonds because the projects they fund generate income from people who use them; it’s that revenue that pays off the bond. A toll plaza, for example, collects the money to pay for a highway. Prop. 53 would require voter approval whenever the state wants to pay for a public works project using more than $2 billion in revenue bonds. The measure specifically defines “state” to exclude cities, counties, school districts and community college districts, which would seem to excuse them from this requirement. But Prop. 53 also would require voter approval if the state is a partner in a project. And that’s what concerns local governments, which sometimes partner with the state to get a better interest rate on bonds, says the Legislative Analyst’s Office. City and county officials are concerned Prop. 53 could delay critical projects such as bridge and freeway repairs, and put decisions about them in the hands of voters statewide. Firefighters are concerned that there’s no exemption for disasters, and that could delay rebuilding critical infrastructure after an earthquake. Prop. 53 would affect just two current projects: high-speed rail and Gov. Jerry Brown’s Delta tunnels. And the measure’s backer is a longtime opponent of the tunnels. Delta farmer Dino Cortopassi and his wife, Joan, are spending millions to bankroll the campaign for Prop. 53. Cortopassi insists in the press that the measure has nothing to do with his opposition to Brown’s tunnels. He says it’s meant to force lawmakers to be honest about the cost of expensive public works projects, and to give taxpayers — who will ultimately pay for the project through user fees — a say in how much debt the state takes on. To pay for major construction projects, such as roads, bridges, dams and prisons, the state often uses money collected from taxes. 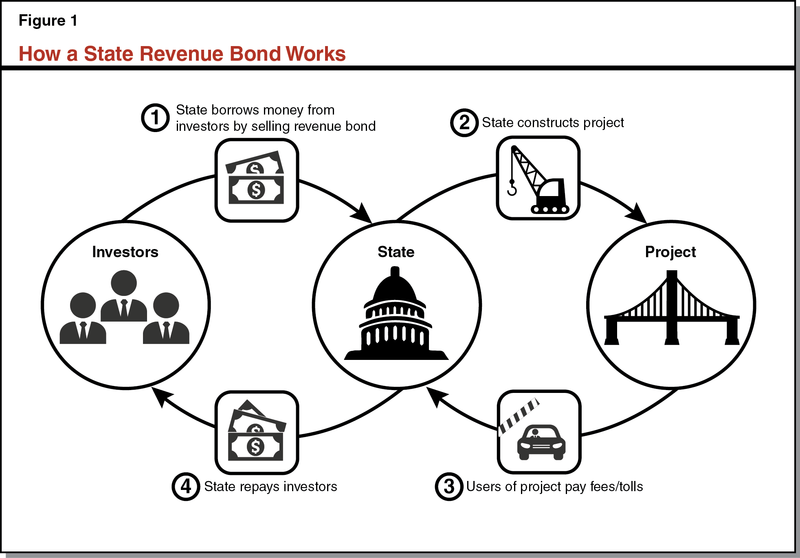 Another way the state pays for these projects is by selling a special kind of bond, called a “revenue” bond, to investors. Once a project is completed, fees, such as bridge tolls, are then used to pay back the bond. Under current law, the state may sell revenue bonds without voter approval. Voters would have to approve revenue bonds that add up to more than $2 billion for a specific state project. Bonds sold at the local level, for example by cities, counties, or school districts, would not be affected. The effect is hard to predict. There probably won’t be very many projects using revenue bonds that cost $2 billion or more. Very large construction projects could be affected, such as high-speed rail or regional water systems. The cost will depend on whether voters approve specific bonds and, if they don’t, whether the state decides to pay for the project in a different way. The state should be required to get voter approval before taking on expensive building projects. Prop 53 would give voters a voice and hold the state accountable for its spending. Having to wait for an election could make it hard for the state to respond to disasters and emergencies. Voters from across the state should not be able to decide what is best for a project that affects a local community. Applies to any projects that are financed, owned, operated, or managed by the state, or by a joint agency formed between the state and a federal government agency, another state, and/or a local government. Prohibits dividing projects into multiple separate projects to avoid statewide voter approval requirement. The measure’s fiscal effects on state and local goveMeasure Likely to Cover Relatively Few Projectsrnments are unknown. It is unlikely there would be very many projects large enough to be affected by the measure’s requirement for voter approval. However, for those projects that are affected, the fiscal effects would depend on what actions the state, local governments, and voters take in response to this measure’s voting requirement. (2) the California High-Speed Rail project. It is possible other large projects could be affected in the future, such as new bridges, dams, or highway toll roads. Government and Voters Could Take Different Actions. (1) It requires California voter approval for STATE projects that would use over $2 billion in state revenue bonds. (2) BEFORE THAT VOTE, it ensures full disclosure of the TOTAL COST of any state revenue bond project greater than $2 billion. Currently, other state bonds for water, school and transportation projects require voter approval. But a loophole in state law allows politicians and unaccountable state agencies to circumvent a public vote and borrow BILLIONS in state revenue bond debt for massive state projects WITHOUT VOTER APPROVAL. Right now, there is NO VOTE BY THE LEGISLATURE OR THE PEOPLE required to issue these massive state mega-bonds. Unelected and unaccountable state bureaucrats have all the power and you have to pay through higher water rates or increased fees! Proposition 53 says IF YOU HAVE TO PAY, YOU SHOULD HAVE A SAY. Proposition 53 just GIVES YOU A VOICE, A VOTE, added TRANSPARENCY, and it HOLDS POLITICIANS ACCOUNTABLE. That’s it! Read the initiative for yourself. Despite the scare tactics of the politicians, bureaucrats and corporations that feed off of the state’s public debt, Proposition 53 DOES NOT IMPACT LOCAL PROJECTS, the University of California, freeway construction or needed response after a natural disaster. Proposition 53 SIMPLY APPLIES THE LONG-STANDING CONSTITUTIONAL PROTECTION against politicians imposing higher debt without voter approval to MASSIVE STATE REVENUE BONDS. Proposition 53 just ENSURES FULL BUDGET DISCLOSURE AND VOTER APPROVAL of state revenue bonds for California’s mega-bucks projects that will affect future generations. Join California’s leading state and local taxpayer organizations, small businesses, working families and nearly one million Californians who put Proposition 53 on the ballot. Vote YES on 53! Prop. 53 is opposed by a broad, bipartisan coalition of organizations including California Professional Firefighters, California Chamber of Commerce, California Hospital Association, firefighters, paramedics, family farmers, environmentalists, nurses, law enforcement, and local governments because it would erode local control and jeopardize vital infrastructure improvements in communities across California. Groups representing California’s cities, counties and local water agencies, including League of California Cities and Association of California Water Agencies, all oppose Prop. 53. Under this measure, cities and towns that come together to form a joint powers agency or similar body with the state to build needed infrastructure could have to put their local project on a statewide ballot. That means voters in faraway regions could veto some local projects your community needs and supports—like water storage or bridge safety repairs—even though those voters don’t use or care about your local improvements. This measure is financed entirely by one multi-millionaire and his family, who are spending millions in an attempt to disrupt a single water infrastructure project. Irrespective of one’s position on that single project, his initiative has far-reaching, negative implications for other infrastructure projects throughout California. We cannot allow one multi-millionaire to abuse the initiative system to push his narrow personal agenda. Erodes local control by requiring a statewide vote on some local projects. Disrupts our ability to build critically needed water storage and supply. Contains no exemptions for emergencies/natural disasters. Prop. 53 doesn’t give you a say. Quite the opposite. Prop. 53 erodes your voice and the voice of your community. Please read it for yourself. Local government groups representing California’s cities, counties and local water districts, including the League of California Cities and Association of California Water Agencies, oppose this measure, warning it could give voters in faraway regions the power to deny local projects your community needs. Prop. 53 will jeopardize your community’s ability to fix aging infrastructure, including improving water supply, making bridge and freeway safety repairs, and renovating hospitals to make them earthquake safe. Prop. 53 is a multi-million dollar attempt to stop one single project. We cannot allow one well-financed individual to abuse the initiative process and jeopardize vital infrastructure and safety projects around the state. Firefighters, paramedics, family farmers, environmentalists, nurses, cities, counties, local water districts, and law enforcement. Proposition 53 trusts voters. Proposition 53’s opponents are afraid of voters. OPPONENTS INCLUDE SPECIAL INTERESTS WHO HAVE FOUGHT TAX REFORM FOR DECADES, EVEN PROPOSITION 13. They include insiders who profit from massive state revenue bond projects, and politicians and bureaucrats who don’t trust you to decide whether to approve boondoggles like the $64 billion bullet train and the $6 billion Bay Bridge fiasco that now requires $6 tolls. IF TAXPAYERS HAVE TO PAY, THEY SHOULD HAVE A SAY! Prop. 53 holds politicians accountable by giving you a vote on state mega-projects paid for by state revenue bonds over $2 billion. Voters will have the right to decide, just as we do with all other kinds of state bonds. And Prop. 53 finally unmasks the true cost of all multibillion dollar state bonds. PROP. 53 TRUSTS VOTERS to decide whether to approve the massive multibillion dollar increase in the bullet train’s price tag. PROP. 53 TRUSTS VOTERS—California taxpayers—to decide by a simple majority whether to spend $17 billion to tunnel water under the Delta to Southern California. PROP. 53 WOULD HAVE TRUSTED VOTERS to decide whether extravagant design changes on the Bay Bridge were worth $5 billion in cost overruns and outrageous tolls that working families can’t afford. Prop. 53 clearly exempts local projects. Read it yourself at www.YESon53.com. IF YOU TRUST TAXPAYERS AND VOTERS more than lobbyists, politicians and bureaucrats, VOTE YES ON PROPOSITION 53!